Indivisible is prioritizing state legislative work this year (as seen in the new Indivisible State Guide). 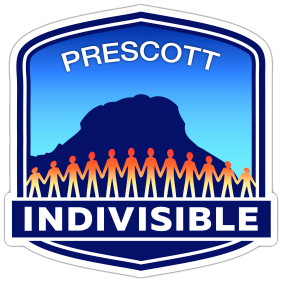 Our Indivisible groups did so well with election work, Indivisible National has prioritized Arizona as a target state – this means more resources, more training, more amplification for our state work! Only five states were selected. It’s a BIG DEAL deal for us to be picked! The Request To Speak program (RTS) is designed to allow the public to register an opinion on bills listed on agendas and to request to speak on a bill in a committee. When the committee is in session, the committee members, and the public, will see a list of names of people who have registered an opinion, if you wish to speak or not, who you are representing, and comments you leave in the comment box. This information is also available if a person searches past committee agendas. Legislators will see your bill position throughout the process. Civic Engagement Beyond Voting has just introduced a new video on the Request to Speak system – please view it; it will take you less than five minutes. RTS Training will be given on Sat. 2/16 and Sat. 2/23 noon-2p at the Prescott Valley Library, 2nd floor computer lab. You must preregister by Fri. 2/6 – send an email to Julia Watson empowermentaz2016@gmail.com. Whether you are new to RTS or need a brush-up session, this is the class for you!